Just as it does today, the immigration issue drew an outpouring of tweets during the first month of Donald Trump’s presidency, when the executive order to restrict entry to the U.S. by people from certain countries was first issued. When it came to sharing links about immigration, most users included at least one link to a news organization site, as opposed to a commentary, advocacy or other kind of site, the Center’s analysis finds. About eight-in-ten (83%) of the more than 2 million users who tweeted about immigration with a link during this time period shared at least one tweet that had a link to a news organization site. Yet most of these users did not tweet about immigration regularly. On average, the large majority (84%) of those who tweeted about immigration with a link did so just once a week or less during the period studied. In contrast, a smaller core tweeted daily or more – 14% of users in this dataset shared a tweet about immigration with a link daily, on average, with another 2% doing so semi-daily (more than once per day, but less than hourly), and fewer than 1% posting hourly, on average. 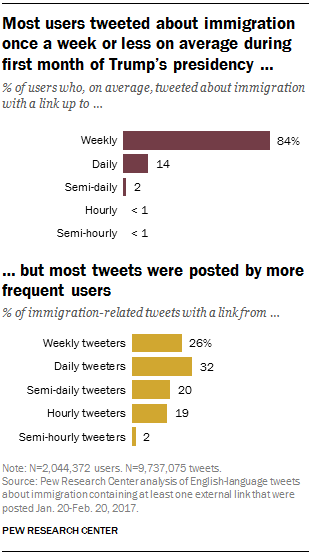 Tweeting links to immigration news was common across user types during this time period, with at least seven-in-ten in each category tweeting at least one link to a news organization. Given the range of sites users could have linked to, including news, commentary or advocacy sites, the universality of news organization sites underscores the prominent role news played in the discussion. In fact, users in four of the five user types predominantly linked to news organizations in their tweets: Weekly (79%), daily (91%), semi-daily (92%) and hourly (86%) users all linked to news organizations in a majority of their tweets. Only 45% of prolific users (those who tweeted semi-hourly), on the other hand, linked to news organizations in a majority of their tweets.